The Huit (short form of Huitzilopochtli, also called Huey) is a Clan fire support tank. 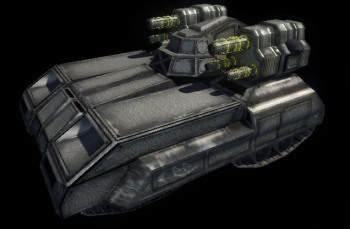 It is the only tank capable of bearing the ArrowIV launchers along with additional heavy weaponry. A unique feature of the Huit is that its missile launchers, often the paired Arrow IV launchers, are mounted static on the tank chassis, not on the rotating turret like for all weapons on any other tank. This gives both advantage and disadvantage. One is that tank driver need to watch where the launchers are pointing in order to avoid hitting rocks or trees -- or friendlies. On the other hand it offers a unique possibility to hit targets behind cover, by arcing the missiles around obstacles. The greatest weakness of all the Huit is its low armor, comparable to the Partisan rather than other, more heavily armored tanks. This forces a Huit pilot to avoid any danger, even more so as a Huit's top speed is miserable. The Clan Arrow IV platform. GECM makes it difficult to lockate Huit Prime. Its 2 PDSs, duo of MGs, duo of CMPLs and single cUAC5 will help dealing with enemy Battle Armor as well as some light scout, but its unable to defend itself from even light brawl specialists. Its only redeming feature is GECM. Another Clan Arrow IV missile support with limited AA capability. Twin LBX2 and twin cERLBL give it some punch against airborn targets or any lighter vehicles that try to close in. 4 free tons of aditional ammunition make it capable of moving further from supply lines while using its Arrow IV launchers. The "Anaconda", a famous CLPL variant known for its high damage output at long range. This variant puts out the most heat out of all the huit variants and it also the 1 out of 3 huit variant that doesn't mount ArrowIVs. This variant mounts a impressive array of 3 CLPLs and single cGauss backed up by 18 SHSs makes this variant a deadly long range support unit, being able to lay down a deadly stream of laser fire onto a target. However being the slowest unit in MWLL and one of the more expensive assets leads to very few cases where this unit is seen and that issue is compounded by the light armor of the tank make it a high risk choice. The "Force of Nature", somewhat resembling the Puma C in its laser loadout, though with an additional pair of Arrow IV launchers. Compared to the Anaconda, the C variant's firepower is much less heat-balanced, even compared to light Puma C) because of 9 Single Heat Sinks and hot nature of Clan lasers. It's 4 free tons of spare ammunition make it somewhat base-independent. 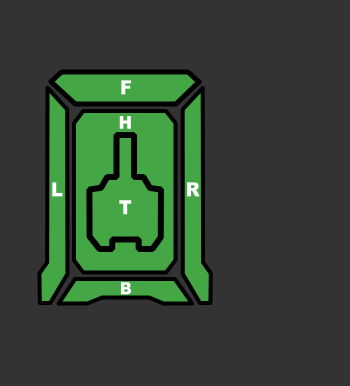 This variant best works using chainfire, where each trio of lasers is set to different group, allowing it to control heat. Geared more towards direct fire support it provides a heavy long range punch with its two cERPPC that are backed up with two cUAC5s to try and scare off any plane that tries to do a fly by. This huit variant also still carries single arrowIV launcher to provide extreme long range fire power provided there is a narc up for it. This huit has to be careful with its heat as only 10 heat sinks struggle to keep the heat down from the arrows and cERPPCs. Its radar abilities are lacking combined with the low speed and high price you dont see many of these huits and they must take care so that they are not left behind if the front line gets pushed back towards it and with only 3 free tons of ammo it can not stray too far from home before having to return to base or a APC. Nicknamed "Black Beard MK-IV" this huit variant lives up to its nickname in every sense of the word. Packing trio of ATM6s it is able to rain missile fire down onto targets at mid range. Single HAG40 and cERPPC provide long range firesupport for larger mechs to have around as they would take the blows done by the enemy and the huit would soften them up with lots of missiles. Its ATMs and HAG are also effective at AA work provided the plane is slow like a VTOL or not turning much. However if anyone decides to go after the huit it lacks any real close range weapons so care must be take to not let anyone close to it, as the ATMs have a 125m minimal range, so any mech that steps on it will not worry about being shot back with its main damage weapons. With 2 free tons of ammo, it will find itself out of ammo quite fast. Its the most armored variant, with 11.5t of armor, GECM and PDS should enemy BA get too close, capable of using its TAG to guide allied missiles. This Huit is designed to do one thing: shoot things that fly. To this end, it packs a full 8 CUAC2s to give it the power to steadily pick away at opposing air assets. As good as the F is on paper, it often falls short in practice -- the UAC2s require a lot of time to work their magic against larger bombers, while smaller aerospace assets are difficult to properly lead and hit. 8 free tons will keep huey on the field for a while. G with its duo of cGauss rifles and single Arrow IV is heavy firesupport with decent AA capabilities. 2 cMPLs helps with dealing with enemy Battle Armor, should allies let them get too close, but wont help against enemy brawler, as it dont have armor nor firepower to survive the engagement. Lack of any electronics wont help either. The Huit B was found to be overpowered in the first beta version of MWLL, leading to an 11 page forum thread, "BALANCE: Huit tank far too powerful for cost", along with several others. Some players decided to use Huit B in protest all the time, making them the most common tanks on some maps, most notably Marshes where it could keep constant fire for nearly a minute while standing in water. The problem was solved in Beta 0.1.0 by decreasing its heat efficiency and increasing price. The Huitzilopochtli Assault Tank is an 85 ton artillery platform. Better known as Huey, this tank is too slow to move across distances on its own, instead being transported by Drop Ship, but the weapons it carries are most impressive. Arrow IV launchers can be packed with TAG-guided missiles, area-effect or FASCAM submunitions dropping mines on the battlefield. For close range defense it has turret-mounted Medium Pulse Lasers and ER Small Beam Lasers with additional side-mounted MGuns giving it overwhelming firepower against the troops or Battle Armors. For defense against vehicles the Huey carries UAC5. An ECM suite makes it harder to engage a Huitzilopochtli, though it's not enough to hide it entirely from the enemy sensors. A low five and a half tons of armor force it however to stay behind the lines. Hueys were used first time by the Clan Jade Falcon during invasion on Coventry, though they are manufactured by other Clans as well. This page was last edited on 13 February 2019, at 15:42.